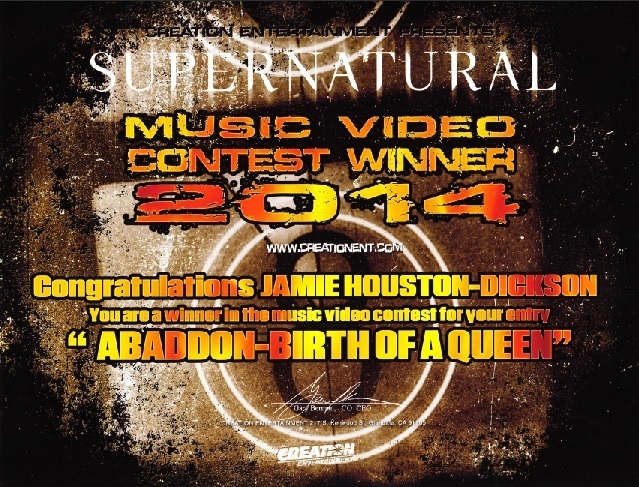 I've always wanted to do a Supernatural video, and decided that the music vid competition for the Toronto 2014 Supernatural convention put on by Creation Entertainment was finally the time to jump in. After some mulling over music and noting that the fantastic Alaina Huffman was slated to attend, this idea was born (pun!). As is my custom, I had left this video to the last minute and scrambled to get the submission together in time to meet the deadline for the competition. Forty hours without sleep and a rather expensive next-day shipping bill later, I just managed to send it off with a few hours to spare. It was worth it, though, as it was chosen as one of the winners and was shown on the big screen as the intro for Alaina's panel (Oct. 12/14 - for those who saw it at the convention, the projector system caused a bit of delay between the audio and video, so this version should be on the beat properly). Alaina said she enjoyed it, and I hope you do as well. Note - playback is nice and smooth in most browsers, but can get a bit rough and jittery in Internet Explorer. This video was made for entertainment purposes and not for profit. Video clips are property of The CW and affiliates. Music is property of 30 Seconds to Mars and affiliates. Please do not use any portion of this video for any purposes other than personal viewing.